And here you have it, readers! 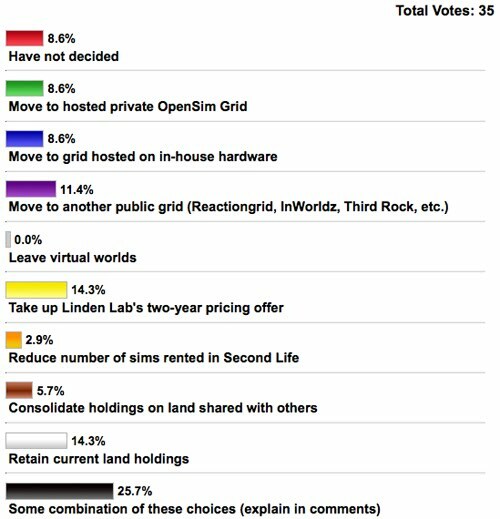 22.9% of respondents will be staying (for sure) in Second Life; another 25.7% will try some combination of the options above. Linden Lab may break even on this price-increase, if my 35 respondents are representative of the larger edu-crowd. 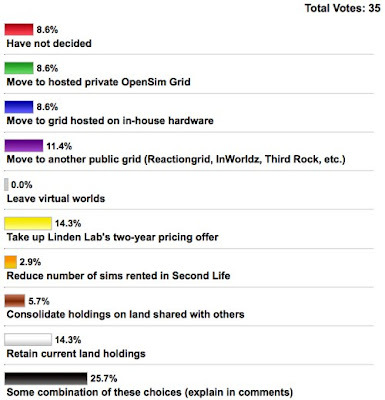 Of interest to me is that none of the respondents plan to leave virtual worlds. 28.6% plan to move their work out of SL, however. We'll see what occurs next, on the day that rumors of Philip Rosedale's departure from the CEO job at Linden Lab (again) are flying about the ether. I'll ask for a second opinion about your plans, but let's wait a few months and poll you again. By then many campuses will have come to the end of their contracts and made a decision.